New Zealander Greg Henderson delivered Team Sky's first major victory in Europe with a gritty sprint finish in stage one of the Paris-Nice race. 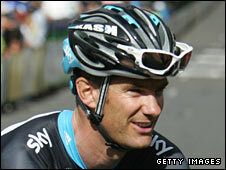 Henderson just beat Slovenian Grega Bole after joining a breakaway that also included Britain's David Millar. Dutchman Lars Boom retains the overall lead from Jens Voigt, with Millar 13 seconds back and Henderson sixth. "It was a headwind sprint and it was in slow motion. It was so hard and I was lucky to get it," said Henderson. "To win here in such a beautiful race, it's a real honour." Former Commonwealth and world track champion Henderson, 33, won in Team Sky's race debut back in January, in a criterium event in Adelaide. The team have also put in strong showings in Qatar and Oman but results in Europe are generally considered a better guide to form ahead of major races later in the year. Juan Antonio Flecha won the Omloop Het Nieuwsblad in Belgium on 27 February for Sky's first victory of any sort on the continent. On Monday, Henderson joined a group of 15 at the head of the race, with 9km to go in the 201.5 km ride from Saint-Arnoult-en-Yvelines to Contres after the main group broke up in strong crosswinds. "It's a credit to the management that put the team together," he added. "They selected a group of great guys and we wanted to say we're not just here for the show, we want to win bike races." Two-time Tour de France winner Alberto Contador fell behind over the last 15km, then crashed with 3km to go, although he did not appear injured. The eight-stage, 800-mile event ends in Nice on Sunday.